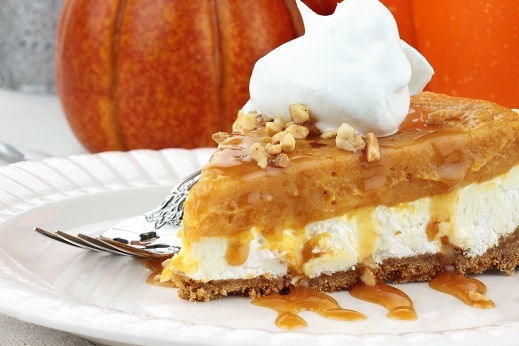 Pumpkin pie has been enjoyed in the North American as far back as 1621. As there were no ovens at the time, pumpkin pie then, had no crust. 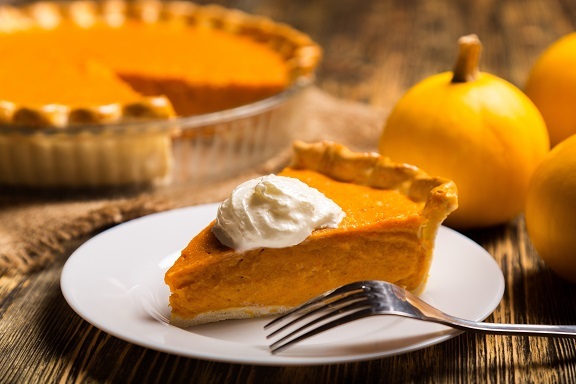 According to historians the first settlers to the New England (USA) area made pumpkin pie by filling a hollowed out pumpkin shell with milk, honey and spices, and then baking it in hot ashes. By the early 18th century pumpkin pie had earned a place at the dinner table, as Thanksgiving became an important New England regional holiday. Today the pie is baked with a crust and is a traditional sweet dessert, and is enjoyed more than not during the fall and early winter, especially for Thanksgiving and Christmas in the United States and Canada. Baking a pumpkin pie before 1929 required a person to roast and strain the meat of the gourde or squash. Things changed though in 1929 as Libby’s meat-canning company of Chicago introduced canned pumpkin that replaced the need for roasting and straining one’s own squash. The pie can be described as a pumpkin-based custard, baked in a single pie shell, and almost never has a top crust, like an apple pie does. A traditional pumpkin pie today is generally flavored with spices like cinnamon, ginger, nutmeg, and cloves. Some bakers may go a step further and add cardamom and vanilla. There are many ways to enjoy pumpkin. Since 1929 it was made a lot easier to enjoy it any time of the year. 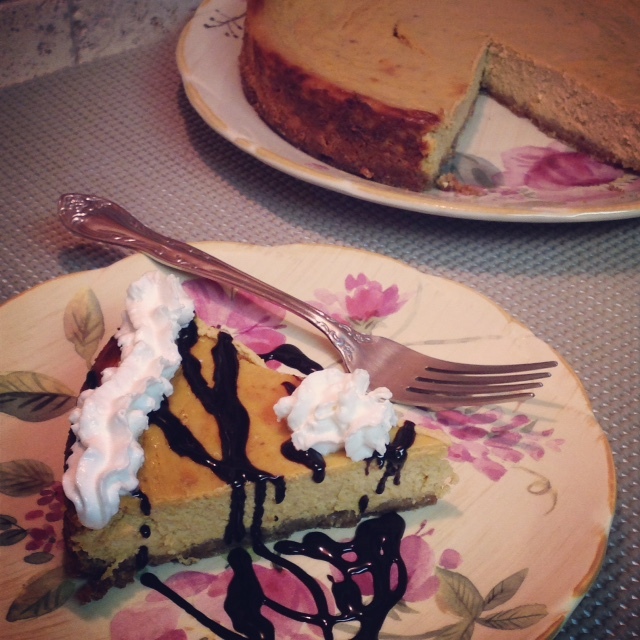 Here are a few recipes that consist of a pumpkin basis. In a large bowl, whisk together cream cheese, 1 tablespoon of half and half, and sugar until smooth. Gently fold in the whipped cream, and it is best to avoid over mixing. Spread mixture into the bottom of a prepared graham cracker crust. In a large bowl whisk pudding mix and 1 cup of half and half until thickened, fold in pumpkin, cinnamon, ginger, and cloves. Gently spread over cream cheese layer. Place in refrigerate for up to 4 hours, or until set. 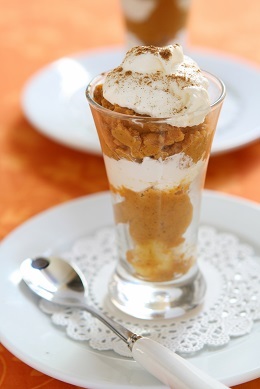 If you wish, drizzle lightly with caramel sauce and add a dollop of fresh whipped cream, and toffee bits before serving. In large mixing bowl, place all pumpkin layer ingredients and mix until smooth and creamy, approximately four minutes. Place in freezer for a quick chill while you prepare your other ingredients. Stir all cookie layer ingredients together in a small bowl and set aside. In large mixing bowl, mix whipping cream on medium high until soft peaks form. Add sugar and vanilla extract and beat an additional minute. Layer parfait glasses very gently following this pattern: cookie mixture, whipped cream, pumpkin layer, whipped cream, pumpkin layer and top with whipped cream. Sprinkle remaining cookie layer on top. Repeat for each parfait. You can also enjoy Gluten Free Pumpkin Cheesecake or Layered Pumpkin and Cranberry Parfaits, and Pumpkin Muffins with Pecan Streusel Topping. Today, October 12th is National Pumpkin Pie Day, enjoy a slice or two, or any dessert with pumpkin in it. We plan to enjoy a Spiced Pumpkin Latte. This entry was posted in Dessert, National Food Days (USA) and tagged A Simple Thanksgiving Breakfast, Bartender, Beurre noisette, BuzzFeed, Cake, Condensed milk, Cream, Double Layer No Bake Pumpkin Pie, history of pumpkin pie, pumpkin, Pumpkin Cheesecake, Pumpkin muffins, Pumpkin pie, Pumpkin-Pie Parfaits, Spiced Pumpkin, United States. Bookmark the permalink. Hey thanks Mr. Militant for the reblog. Don’t forget to enjoy some pumpkin pie today!!! Thanks for reblogging our post! !